Home – Each individual home revolves around a central, south-facing glazed courtyard. These private, sunlit, outdoor spaces create a physical separation between the public areas of each house, whilst maintaining visual links and blurring interior-exterior boundaries. Street – 13 residential units and 11 parking spaces are provided within a high quality; sustainable and distinctly modern scheme. The design complements the historical context of the conservation area while maintaining the distinction between old and new. 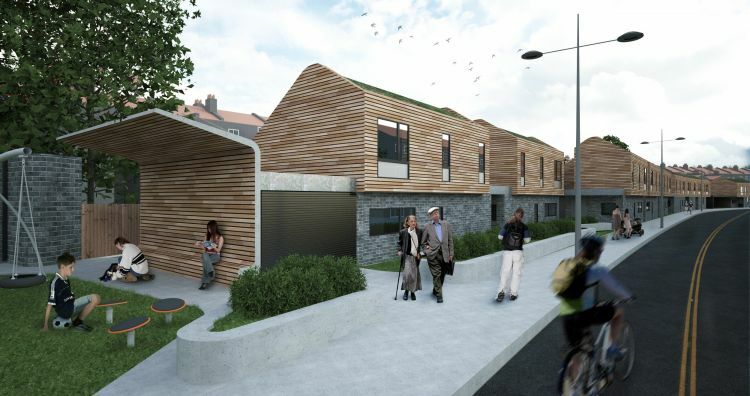 Amenities – The low-rise development leads to a community centre and open public spaces, enhancing the sense of community, often only experienced in the countryside. The intention is to encourage a strong sense of ownership, belonging and community spirit. Community – The expansion of Victoria Park Peabody Village calls for an accessible community centre providing health & wellbeing activities. The proximity to a primary school is an opportunity to develop a connection with the wider local community, as well as offering space for joint activities, further promoting a sense of belonging. Sustainability – Environmental considerations were instrumental in the formation of the final design. 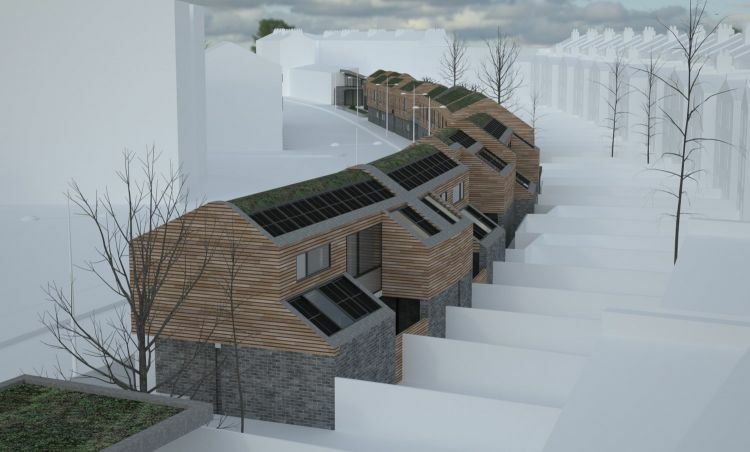 Optimisation of the roof pitch allowed full integration of Solar PV into the design rather than as an afterthought. Reliance on electricity from the national grid is minimised through strategic placement of south-facing glazing together with increased levels of insulation and the use of waste heat from the local electricity substation. • Enhanced sense of belonging via scale of development, careful location on-site. • Careful design of homes as sanctuaries which meet both physical and mental needs of their residents. • Provision of public local space even in a small scale development supporting local residents of all ages in their daily lives and future aspirations. • Joint activities with the local school connecting the community with the winder local area. • Identification and implementation of innovative sustainable technologies locally available, i.e. heat waste management from local power substation station.